This is a Khorium ore or Titanium ore for Cataclysm, which is used for highest level item crafting. 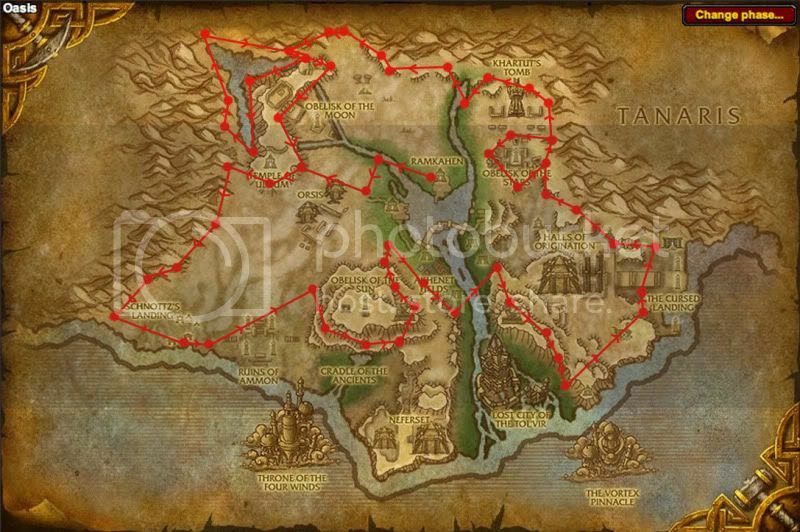 Can be found in Twilight Highlands and Tol Barad. This is a rare spawn for Elementium ore.
Interestingly, IRL pyrite is the mineral known as 'Fools Gold' - and it's incredibly common here on Earth. Its name means 'from fire', so called because of its tendency to spark when you hit it. In game, it's also used to make Truegold, the expansion equivalent of Arcanite. Early results indicate nothing more than one uncommon quality gem and 1-3 volatile earths ... based on prospecting 20 ores. Unsure why my post god deleted, but as I said - you can also find Pyrite in Ulduar. For about 2 days I had Twighlight Highlands all to myself for gathering. I got about 1900 Elementium and 250 Pyrit, so it's spawn rate is about 13% of all nodes. I, too, took advantage of the leveling rush and had Twilight Highlands to myself for a day or so. Out of 1000 Elementium I got 110 Pyrite. 10%-13% is a pretty safe guess on the spawn rate. I'd like to know how your guildmember got to 525 JC on release day, when the only recipes that give skillups to 525 either require a couple Cataclysm JC tokens (from a daily quest only available at 475 skill) or has a 20 hour cooldown (Fire Prism). Draenei racial provides +10 jwc skills, making it possible to obtain 525 without using tokens. Somewhat offtopic. Did this person get the Realm first! Illustrious JCer when they reached 525 using the draenei racial? Best place for Pyrite ore currently (on my server) is Tol Barad. Rich Pyrite nodes give 5-7 pyrite each. After a few hours of farming I have 7 stacks. This won't be true for long as this zone fills with pvpers and farmers. Also of note is that you are unflagged between battles so ganking isn't a concern (pve server). Pyrite Ore is currently going for about 75 gold each, and Pyrite Bars are going for about 150 gold each. I've seen several veins around in Uldum / Twilight Highlands while on my mage ( non miner ). Gonna let up my rogue to 85 so I can get a chance and some of it before prices drop too much. Don't prospect Pyrite yet! Wait until Blizz releases the epic Cataclysm jems. They aren't implemented, so currently you will only get the same gems you get from prospecting Elementium. Edit: What's with the downrating? It is perfectly true that currently (4.0.3) epic gems are not implemented and that pyrite prospecting yields the same types of gems as prospecting elementium. Wait until the epic gems are released to prospect. When are they implementing the epic gems? Prospectable at JC skill of 500 as of today. This ore is not selling for near the price it will fetch for the majority of the expansion. When higher end patterns require Pyrite Bars, and Cata epic gems start becoming prospectable from this ore, this well sell for a much higher price and at a much faster rate. Can anyone tell me the best place to mine pyrite ore? Fool's Gold was given it's name because of it's similarity in color to real Gold. Back in the 1800's someone discovered a large amount of Gold in western Canada and the effect was a massive gold rush. Land was bought quickly and some would argue today that this is why the west became as populated as it is. The mineral pyrite, or iron pyrite, is an iron sulfide with the formula FeS2. This mineral's metallic luster and pale-to-normal, brass-yellow hue have earned it the nickname fool's gold because of its resemblance to gold. The color has also led to the nicknames brass, brazzle and Brazil, primarily used to refer to pyrite found in coal. Pyrite is the most common of the sulfide minerals. The name pyrite is derived from the Greek πυρίτης (puritēs), "of fire" or "in fire", from πύρ (pur), "fire". In ancient Roman times, this name was applied to several types of stone that would create sparks when struck against steel; Pliny the Elder described one of them as being brassy, almost certainly a reference to what we now call pyrite. By Georgius Agricola's time, the term had become a generic term for all of the sulfide minerals. Pyrite is usually found associated with other sulfides or oxides in quartz veins, sedimentary rock, and metamorphic rock, as well as in coal beds, and as a replacement mineral in fossils. Despite being nicknamed fool's gold, pyrite is sometimes found in association with small quantities of gold. Gold and arsenic occur as a coupled substitution in the pyrite structure. In the Carlin, Nevada, gold deposit, arsenian pyrite contains up to 0.37 wt% in gold. But what none of you are thinking of is that if pyrite ore is used NOW for 4.0.3 gear then their probably gunna add a new ore or something because IF they add new pat's for bs and the likes then those pats will probably require better mats then green bars. most likely is they either add a new ore or some new mat to be used in those items. if cata epics do come out i doubt they'll be from pyrite ore or if so an EXTREMELY low chance. the blues only have a 6-8% chance to drop which was the equivelent of wotlk epics on titanium so if they did add pics they'd have like 0.5-1% chance to get AT BEST. also i say it would be best to prospect it now when you need the gems rather then in 3-6+ months when its worth like 50g a stack because of over abundance. This is just my opinion on this matter so if im wrong when the patch does come out then be sure to say so.Humans are greedy, therefor they are human. Copy and paste from wikipedia hardly makes you an expert on the topic or a historian on the gold rush. I prospected a Chimera Eye out of Pyrite Ore. It was only the second stack of 5 pyrite I prospected. I know its not on the list saying it can be prospeced from pyrite but I most certainly got it from Pyrite Ore. Since then I've prospeced about a stack and a half and haven't got another one, sometimes theres not even a blue gem. I'd suggest just prospecting Elementium. Thanks Shirvington. I almost porspected it, and I guess there are still no epic gems. any word from blizz? EDIT: I do, however, not have any recipies to make any BoP Chimera's Eye gems, that might be a factor. Would love to hear from you who get Chimera's Eye from prospecting Pyrite Ore if you have bought any of the JC-only-gem recipies. Perhaps a Pyrite Dust turn-in will be available in a later patch for JC tokens, which in turn will make this even more valuable in the later patches in this expansion. This is only a speculation. If this is WoW's version of pyrite.. what did we throw at Flame Leviathan back in Ulduar? I'm pretty sure that was called pyrite as well, but was liquid and blue. Any insight? Has anyone come across this bug? Normally I would get 12,650 experience when mining a pyrite deposit. Now I'm only getting 12 (twelve) experience. It's almost as if the decimal point was moved over 3 places. Double checked it on my experience bar and chat log. The rest of the mining deposits I'm getting the right amount of experience. I was finding it rather lucrative to farm these in Twilight Highlands. A nice path through the river up around Grim Batol. I was finding four and five nodes of Pyrite clustered together around the gates of Grim Batol along with six or so nodes of Elementium Ore just between the two gates. Unfortunately due to the phasing of the zone when you begin the chain Precious Goods it changed the phasing. Now I can see all the nodes on my mini map and visually but when I get close to mining distance they all disappear. If only I could send stuff from my Eve Online character to my WoW character. Every time I refine Scordite in bulk, I think about how much farther the resulting hundreds of thousands of units of Pyrite would get me in THIS game. I am one of the many prospecting pyrite ore in the hopes that it will later contain epic gems. Some are saying it may come from Black Iron Ore, but I do not agree, seeing as how it is prospected at 425, is deprecated, and is common quality. Granted, that was what was data mined, so I have no real way of knowing. What does concern me about pyrite however, is that it is prospect-able RIGHT NOW and that it is prospect-able at JC 500, while Titanium Ore was prospect-able at JC 450, which was the max JC in Wrath. 500 is not the max JC in Cata, which leads to my concern. Hopefully these two bank tabs of pyrite will result in more than just uncommon and rare gems and volatile earth. Does the Icon for this item make anyone else think of Chrono Trigger and the Rainbow items you'd get at the end of the game from crafting from the rainbow shell? It's Gay Pride ore. Actually. I agree with those who think that epic gems will come also from Pyrite Ore.
Titanium Ore wasn't prospectable before 3.2.0, it became prospectable as patch comes (Pyrite Ore is prospectable now). Maximum JWC skill was required to prospect Titanium Ore (500/525 is required to prospect Pyrite Ore). Pyrite Ore costs around 100g / stack on my realm. I'm stacking so much Pyrite Ore as my budget allows me (I have more than 4700 pcs (not stacks) on my alt. I think the possible huge profit (epic gems will be very expensive as patch comes) is worth the relatively small risk. Why? Because as patch notes (or PTR) comes and there will be official information that epic gems will come from Pyrite Ore, 2 things will happen. People will start stacking Pyrite Ore for their own prospecting later + price will go astronomously up. On other hand, if epic gems (for some reason) won't be prospectable from Pyrite Ore, you can still sell them on AH. There were still be a lot of people prospecting it for rare gems or buying it as reagent for crafted items (Truegold, etc...). Alternatively, you can prospect them by yourself to get rare gems and sell uncutted gems on AH, or you can cut them and sell the too (you should probably check prices on your AH, what will make you bigger profit). I'm doing daily JWC almost every day and saving all Illustrious Jewelcrafter's Tokens (have more than 100 now). I'm not learning rare recipes. A lot of people does so I won't profit too much from them. I'm rather saving them to buy a lot of epic recipes later in patch 4.2.0. It is possible, that Pyrite Ore will produce equivalent of Titanium Powder after introducing patch 4.2.0 - another profit or another source of epic JWC recipes. Please note that all information here is pure speculation. Nothing is confirmed. If you decide to run the risk, it's your decition. Don't blame on me later if something goes wrong. Like mentioned previously, im saving up all my Pyrite (currently sitting on 100stacks+) in hope of the implement of epic gems like previous expansions. You win some, you loose some.. You never know. I am risking it on this one, I have about 100 stacks of pyrite sitting in a guild bank, I am pretty optimistic that this will prospect into epic gems. and if not, well then my guild will have an abundance of pyrite for their crafting needs. This is so much Pyrite sitting in banks atm and so many JCs...the epic gem market is gonna be bust. The idea that many people are sitting on tons of pyrite, and iron pyrite being fool's gold, make me rofl. It's 4.2 and no sign of epic gems. Everyone talks about this "pattern" of epic gems coming from prospecting rare ore, but that was only in WotLK. BC epic gems weren't prospected from Khorium. Are you still stashing pyrite? Handily, on several servers you can make money from Pyrite Ore just by smelting it into Pyrium - on my server, for example, it's about 100% profit margin. Not sure why - I think the fact that it's the only ore in the game where the name changes (Pyrite to Pyrium) may have something to do with it. i hope epic gems will drop from the new instance and won't be prospected from pyrite ore because, well, you know, all servers are full of botters (yeah stupid people that run in circles for hours). Why was the miner arrested for possessing and selling these rare ores? Tom Chilton: There certainly are quite a few new profession recipes. We also introduce the epic gems in this patch, and they'll be available only through the normal and heroic difficulty of the Deathwing raids. Don't try to dump it all right now. They're still used for Truegold... for (probably) new crafting recipes. They might produce some sort of Pyrium Powder for jewelcrafting. Might be used for new alchemy transmutes. We don't have a lot of information about 4.3 professions yet. At the very least they can be prospected for some green/blue quality gems. Just don't dump all the gems at once. Do it over time to maximize your profit. You've held on to the stockpile for this long... you can hold it on for a bit longer. VV Well, in one of the interviews, they did say that "Quite a few" new profession recipes will be added. How many of what this entails, only Blizzard knows. With the announcement that Pyrite Ore will not prospect into epic gems, the prices are fluctuating right now on the auction house. I would strongly suggest buying stacks as low as they can go and prospecting them. Buying people's cheap Pyrite Ore and prospecting it at the right price right now is potentially a GOOD MOVE. Take it before prices spike again! Going to invest 4k+ gold into buying these and selling them for high come 4.3, I do reckon these will be prospectable for chances of epic gems. Because I think Blizzard will get a lot of trolls if we can only transmute them. Ok don't panic, I too have hoarded a tab full of Pyrite. Now Ghostcrawler did say 'Deathwing Raid content'. What about the people who only pvp? Are they expected to pay out to the high-roller raid gurus who will own the AH with epic gems? I am still going to hang on to my lode and ride out the negative news...things will change. There is absolutely no reason to sell pyrite ore right now. The prices are all time low, everybody is selling with few people buying. Happy Ore Hunting my fellow Grand Master Miners! They made an earlier comment that it was like Khorium, but let's be honest, Pyrite sells like it was Saronite from the Lich King Expansion... Worthless steer clear of mining unless you discover that Thorium is actually one of the most valuable ores, but stay out of Un' Goro crater people those are my grounds! I personally think they may add this feature later on in some smaller patch after 4.3. I wouldn't be surprised with the amount of players stocking Pyrite Ore. I can say almost 25-40% of the JCs will have all recipes on day 1. There has always been a penalty for trying to benefit from last patch stuff in the upcoming patch. Another option is that they do make pyrium powder in patch 4.3....but a very very low drop rate. Then once everyone consumes their storage they double,triple, quadruple the drop chance later on and it won't take a patch to do this just hotfixes. As of patch 4.3 on live, prospecting pyrite ores does not get you Epic quality gems. Who knows, Blizzard might implement it on a minor patch after 4.3.
just prospected 100 obsidium and 80 pyrite - so 20 prospects and 15 respectively - looking for inferno rubies. from the pyrite i got 5 infernos, 2 amberjewels 5 other blues, 16 greens and 38 volatile earth. from the obsidium i got a buncha green stones - not 1 blue. so for value pay the g (around 7g apiece on Staghelm) and prospect pyrite. Is it just me, or do these look a lot like baked potatoes? Every time I see one that's all I can think of. *Note: Uncommon gems are always worth 75s as they can be cut and then vendored for that. Some realms often have Zephyrite posted near 50s on AH, all these can be bought, cut and vendored for profit. This ore is practically useless. Levelled a JC, a BS and an engineer from Wotlk level to MoP level and didn't use a single one of these. The only profit I can see off this is prospecting it if it's low priced (eg 1-2-3 gold) and then creating Cata green necklaces/rings and DE that. Hypnotic dust is worth quite a bit on most servers. Am I the only one who finds it oddly ironic that pyrite ore vendors for more than gold ore? I mean, I know what you're thinking. "No one would vendor either anyway." But you gotta agree that it's weird that pyrite is worth more than gold to NPCs.